St Aubins Bay stretches from St Helier to the harbour village of St Aubin. The beach is sandy and south facing, with safe swimming. Because the beach is so flat, the tide goes out about 300m - creating a huge expanse of beach. In parts, the sea reaches the wall at high tide, but it's only covered completely on the highest tides. 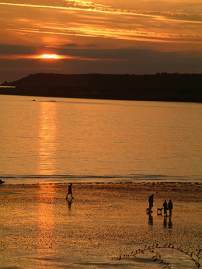 Swimming in St Aubins Bay is generally pretty safe, but at certain times of the year parts of the bay can suffer from large collections of seaweed which make the swimming less pleasant. There is car parking along much of the bay, but make sure you have Paycards with you to display as you can't buy them in the car parks. St Aubins bay doesn't get as crowded as some of the other beaches, although the part nearest St Helier and the area around La Haule can get busy. watersports concession operates at La Haule slip (just before St Aubin), offering jetskis, banana boat rides and waterskiing. There is also a café there and a beach volleyball net. There are cafés and snack shacks along the length of the bay, so you won't have to walk too far to find a drink or and ice-cream. There are toilets at West Park (town end of the bay), Bel Royal (end of the dual carriageway), Beaumont, St Aubin's and some a few minutes walk from La Haule. At the east end of the bay you will see Elizabeth Castle. The castle is surrounded by water as the tide comes up, but the castle ferry is an amphibious vehicle and runs on land or water. 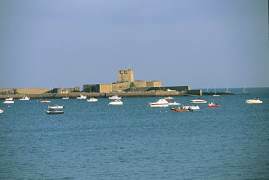 At the west end of the bay, the smaller St Aubin's Fort is also surrounded by the tide as it comes in. You can't get inside the Fort, but you can walk over to it. Best to follow the causeway from the slip outside the yacht club at the far end of the little harbour. If you walk across from the beach you will find yourself wading through a rather muddy area outside the harbour entrance. The Fort is one of the places in the Island where you may spot wall lizards basking in the sun. Just check what the tide is doing first - it's more than a little embarrassing to have to be rescued by the emergency services if you get cut off there!